The Giant’s Causeway in Antrim is a special place to visit on the coastal part of Northern Island that has been recognised by UNESCO as a Heritage site. The National Trust has the responsibility to preserve and protect this unique location. Over a million tourists visit the Giant’s Causeway and surrounding area every year, so the secret’s out. If you’re someone who enjoys scenic views and unusual land formations, then this site is certainly worth the trip. Let’s see what a visit to Giant’s Causeway is about. The Giant’s Causeway has a new Visitors’ Centre which was designed by Heneghan Peng, a prestigious architectural firm from Dublin. They won a competition to put in the most interesting bids in 2005. The centre was inspired by the natural look of the Giant’s Causeway with its design aping the familiar columns. It is 1,800m² and officially opened its doors in 2012. The new building replaces the previous one that was opened in 1986. 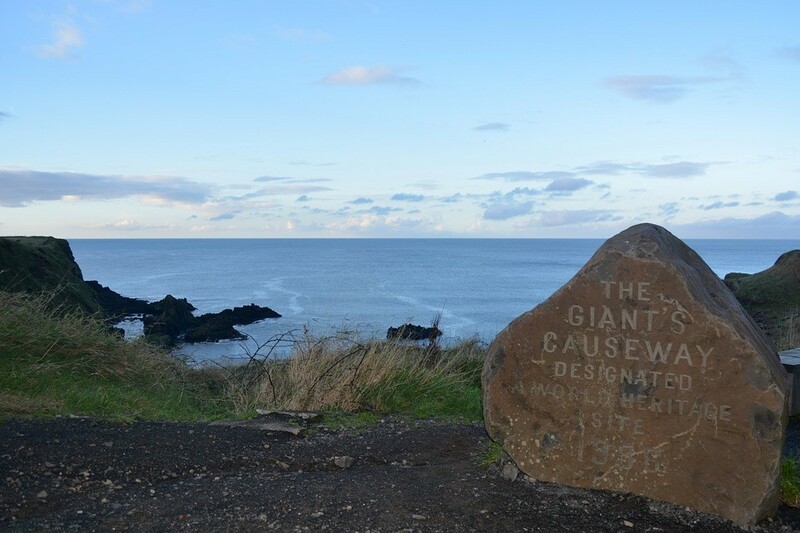 At the centre, there is official information available about the Giant’s Causeway and the Causeway coastal region around Antrim. A booking service is operated to reserve local accommodation, and there is a souvenir shop and a place to change currency. For anyone who enjoys walking in nature, the area has 10 miles of footpaths to explore. Some trails go a little bit inland, but there are plenty that enjoy sea views at various spots along their routes. Several of the trails run directly to at least one of the three notable collection of distinctive columns which make up the Giant’s Causeway. The routes are varied and interesting, so people who find they like walks in the area can extend their stay and walk some different trails the next day too. To get the best out of a visit to the Causeway coastal area, it’s best to take an organised tour. You can be ferried around from location to location without having to worry about dealing with any logistics. Allen’s Tours is a highly recommended guided tour company that has won awards for their carefully created tour of the Causeway region. The awards include being voted ‘Best Tour Company Worldwide’ by Hostelworld.com. You can enjoy seeing the sights while being given interesting information about how the unique columns were formed and other local facts too. You’re bound to get so much more out of a visit here when you get to see all the best parts. It makes the journey totally worth it too. You might have thought that Ireland was all about Guinness beer, but you’d be mistaken. Many films have been shot in the beautiful, vast landscape along the shoreline and coastal areas. The views are nothing short of spectacular and are dramatically different than the rest of the country. After all, this is a place full of history, culture, and rich contrasts. Any visit here is going to be captivating on so many different levels. Don’t miss out on getting to Antrim and its coastline because it is one of the best destinations on offer in the UK.